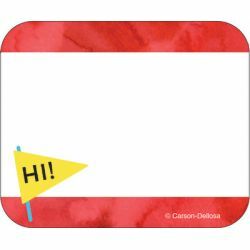 The Celebrate Learning name tag pack contains 40 self-adhesive name tags—each featuring writing space bordered by red, blue, purple, or green watercolor stripes, with a “Hi” or “Hello” sign and measuring 3" x 2.5". Available in a variety of designs, colors, and themes, Carson-Dellosa's classroom name tags are ideal for open houses, labeling documents, and field trips. Browse other Celebrate Learning essentials to create cohesive classroom decor.